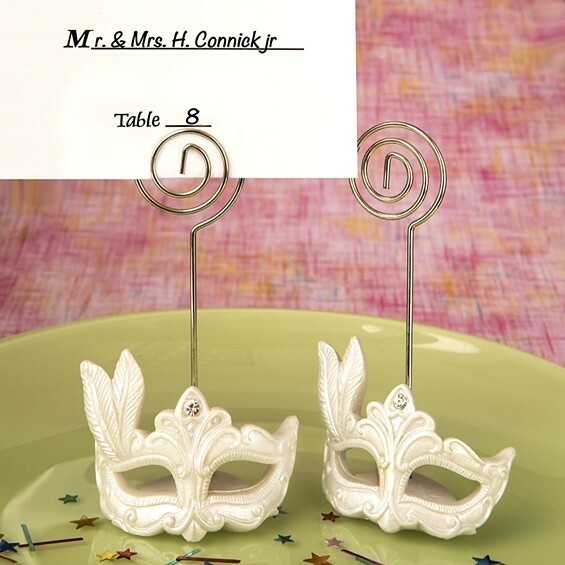 These Mardi Gras mask themed place card holders feature a mask-shaped base made of white poly-resin in a white pearlized finish. This beautifully crafted base features a detailed ornate curved mask accented with a feather design and a clear rhinestone on the top center of the mask. Extending upwards from the oval portion of the base is a silver metal wire with a coiled top for easy insertion of a photo, or to use with the included blank placecard. Mix and match these Mardi Gras themed placecard holders with our Mardi Gras themed masked key chains (available separately as Product Code: FC-8994) to create the fun and festive vibe you want in your party venue! PLEASE NOTE: Sold individually.